The placement of the Puerto Rican flag on Coors Light beer cans to celebrate the upcoming Puerto Rican Day Parade is being called "disrespectful" by local politicians and advocacy groups. HARLEM—The placement of the Puerto Rican flag on Coors Light beer cans to celebrate the Puerto Rican Day Parade is being called "disrespectful" and "insulting" by local politicians and advocacy groups. "It's a total disrespect to the Puerto Rican flag," said Vincent Torres an organizer for the East Harlem group Boricuas For A Positive Image. "The parade is turning into one big commercial where the Puerto Rican people are being pimped." The image of the flag appears wrapped around the bottom of 20 ounce Coors Light can. At the bottom of the can an apple is colored in the red and blue colors of the Puerto Rican flag with a single star. A border around the apple image says National Puerto Rican Parade, Inc.
"It's disrespectful and it's not a good fit," said East Harlem Councilwoman Melissa Mark-Viverito who is Puerto Rican. "When you are talking about a flag and what it represents, being linked to an alcoholic beverage is not reflective of what our culture symbolizes." This year's Puerto Rican Day Parade will be held on June 9 on Fifth Avenue from 44th Street to 79th Street. "What makes this even more egregious is this year's parade theme is: Salud— Celebrating Your Health. Among Latinos, Puerto Ricans have the highest rate of alcohol dependence and the highest rate of the need for alcohol use treatment, according to the National Institutes of Health," read a message from the National Institute for Latino Policy in an e-mail blast titled: "Here They Go Again!" This isn't the first time that MillerCoors, which produces Coors Light, has come under scrutiny for ads relating to the Puerto Rican Day Parade. In 2011, Coors ads featured the phrase "Emborícuate," or "Become Puerto Rican" in Spanish beneath three beers. Torres says the word was taken by many to be a play on "Emborráchate," or to get drunk. After backlash and a social media campaign from Latino advocacy groups, the ads were pulled from New York City subways, bus stops and phone booths. "So it is surprising to many in the Puerto Rican community that the Parade leadership would allow the Puerto Rican flag to be displayed this year on a beer can. Are they willing to allow the perception that in exchange for money or donated product that they would allow unhealthy messages to their community?," read the National Institute for Latino Policy e-mail. "It depicts Puerto Ricans in the wrong way," said Torres. MillerCoors did not respond to repeated requests for comment. The National Puerto Rican Parade, Inc. also did not respond to multiple requests for comment. Torres said he's surprised MillerCoors has not learned from the last blow-up over this issue. A similar effort to get Coors to remove the cans is underway with a protest of a beer distributor planned. The National Institute for Latino Policy is calling on critics to contact the board of directors for the parade. "This can is in every corner store and in every bodega throughout the City of New York and we want it gone," said Torres. MillerCoors shouldn't be blamed alone, said critics. The National Institute for Latino Policy said the flag issue raises the question of "the need for a broader leadership of the parade." 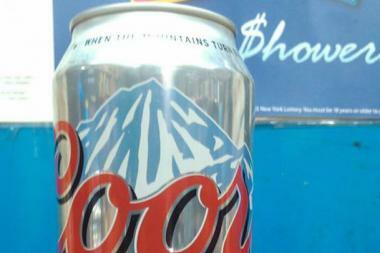 "Not only is this an indictment of Coors but the board of the Puerto Rican Day Parade has to also be questioned. What criteria are they using to determine what a sponsor can or cannot do?" asked Mark-Viverito. "You would like some semblance of accountability and transparency about what the money being raised is being used for," she added.